Physical characteristics: One of the larger shearwaters, the northern fulmar is about 18 inches (46 centimeters) long, with a wingspan of 40.2 to 44.1 inches (102 to 112 centimeters). Northern fulmars resemble gulls, with gray upper bodies and white heads. However, their wings are broader, and the neck is thicker. Their bill is yellow. Geographic range: Northern fulmars live in the northern Atlantic and Pacific Oceans. They breed in the Aleutian Islands of Alaska. Habitat: Northern fulmars prefer the colder water of the Northern Hemisphere. Diet: They feed on fish, squid, shrimp, plankton, and scraps tossed off of fishing boats. If this food is scarce, the northern fulmar will scavenge, eat, carrion, dead, rotting flesh. Behavior and reproduction: Northern fulmars are more aggressive in their use of vomiting as a defense mechanism than are other pro-cellariids. Although commonly confused with gulls, their flying patterns make them easy to distinguish. Northern fulmars hold their stiff wings straight out from their bodies after several quick wing beats, allowing them to glide rather than fly. 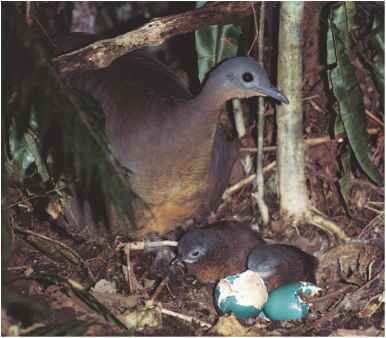 Breeding season begins in May, and nests are actually shallow, bowl-like depressions lined with vegetation. In some areas, the birds lay their eggs on bare rocks. A single egg is laid each year. Incubation lasts forty-seven to fifty-three days, and the parents care for the chick for the first two weeks. Chicks take their first solo flights around the age of forty-six to fifty-three days. 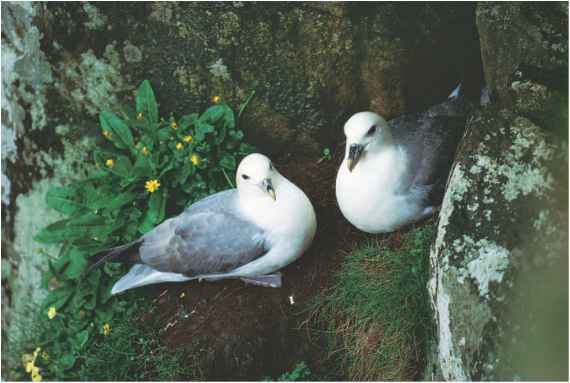 Northern fulmars and people: Although it was once hunted for food, the northern fulmar now has limited human interaction. It comes into contact with humans only on the occasions when it follows fishing vessels in search of food. Servenly, Vincent. Flight of the Shearwater. Kenthurst, Australia: Kangaroo Press, 1997. Warham, John. Petrels: Their Ecology and Breeding Systems. London and San Diego: Academic Press, 1990. "Birds of Nova Scotia: Northern Fulmar." Nova Scotia Museum of Natural History. http://museum.gov.ns.ca/mnh/nature/nsbirds/bns0011.htm (accessed on May 14, 2004). "Manx Shearwater." BBC. http://www.bbc.co.uk/nature/wildfacts/ factfiles/831.shtml (accessed on May 14, 2004). "Manx Shearwater." eNature.com. http://www.enature.com/fieldguide/ showSpeciesSH.asp?curGroupID=1&shapeID=957&curPageNum= 16&recnum=BD0666 (accessed on May 14, 2004). "Northern Fulmar." eNature.com. http://www.enature.com/fieldguide/ showSpeciesIMG.asp?imageID=17710 (accessed on May 14, 2004). "Shearwaters." NSW National Parks and Wildlife Service. http://www. nationalparks.nsw.gov.au/npws.nsf/Content/Shearwaters (accessed on May 14, 2004).